This is the second painting in the series of works begun by 'Inheritance' below. We are back in Glan Banchor, near Newtonmore in the highlands of Scotland and we are now looking down on the setllement of the Macphersons which has grown up by the First Burn. We are looking south west, and the tree-covered mountain is Creag Dubh. 'Creag Dubh!' is the battle cry of the Macpherson clan, and the mountain has special significance for the Clan. To create this painting, 3 visits to the site were made and we made a map of the surviving foundations of the houses, so that buildings could be placed in their real locations. Above the low walls of stone, nothing now remains, as the houses were constructed from timber, thatch and turf. A visit to the Highland Folk Museum in Newtonmore was very instructive, as some of these buildings have been reconstructed and I used them as a basis for this painting. 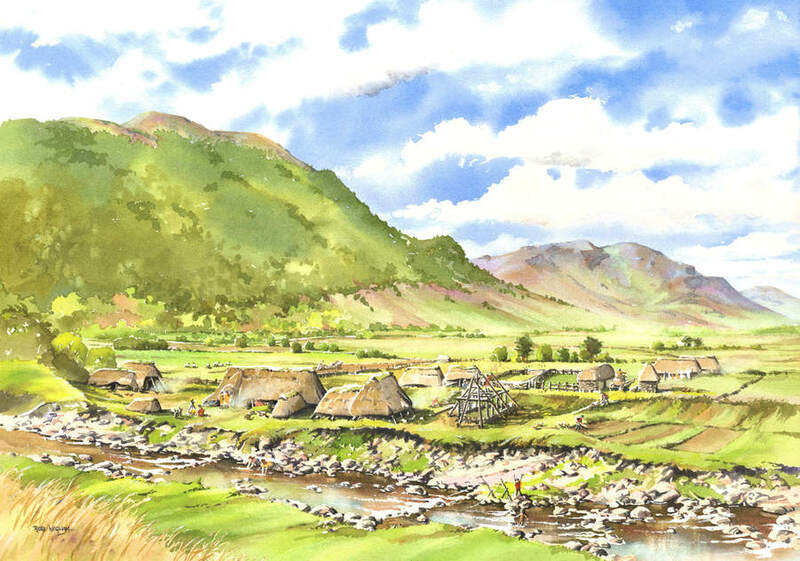 So I hope that I have reconstructed, as closely as possible, a view over the actual village that existed here - one of several settlements in and around the Glen before the clearances.